With 2 doors down and 6 more to go I was feeling pretty optimistic. So far it had taken me around 48 hours total to dig up what information I had so far. But things were going to get a lot tougher. All I had to go on now were the statements the donor had given (namely that one of the doors came from the Grand Opera House building) and the advertisement stickers that were on some of the doors. Not much, really. But it was worth a try to look through the Polk’s again, address by address, street by street and see if there were any possibilities or connections. 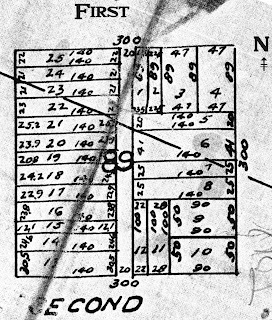 This is how the blocks and their lots were laid out back in the early days; do you see all of the buildings within buildings?? Little tiny businesses and apartments. Oh my. So I began searching for a hatter and found Florey Hatters located at 216 ½ S. Main. Boy this sounds so easy but it took me hours to find the above. And there is absolutely no guarantee that this door went to that business. Dobbs Hats, which began in the 1930's, is still in existence and was probably on the doors of many men’s clothing stores. And guess what? There were TONS of those, practically next door to each other in this little square block. I was amazed at how many there were. One of those being Harrington’s Men’s Clothing store at 109 S Boston, which is perhaps even more likely where this door came from and closest to one of the confirmed lots Mr. B owned. 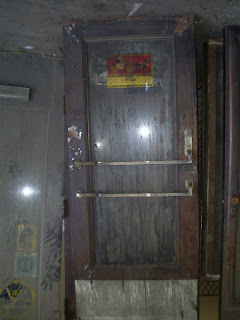 Then there was this door with the FTD and Diners Club stickers. The FTD logo was revamped like this in 1965 (even though FTD itself originated in 1910! which I find amazing). I could find absolutely NO flower shop or gift shop in this area. In fact, the closest one downtown was pretty far away from this area (as far as I know). 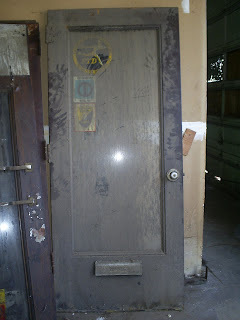 I’m going to guess that this was another “donated” door from a friend.